OSWEGO – The 4th annual “Out Run Autism” 5K kicks off Autism Awareness month this April once again with the support of top sponsor Vona’s Restaurant. Pictured are David Haight of Vona’s, race director and task force member Julie Chetney, Sammy Haight and Elisabeth Haight of Vona’s. 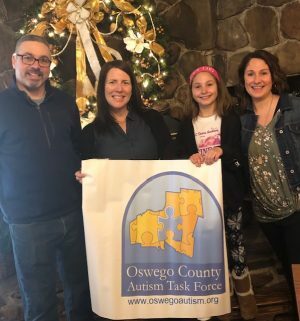 “We are very grateful to have the continued support from the Vona family,” said Oswego County Autism Task Force president Tammy Thompson. This year’s event will also include the Little Lukes “Kids Fun Run,” taking place just before 5K start. The event will kick off at 8:30 a.m. in front of the Press Box Restaurant on East First Street in Oswego with awards to follow. All runners/walkers looking to celebrate the cause post-race or supporters looking to cheer on runners can meet up at the Press Box and enjoy the “Breakfast of Autism Champions” (from 9 – 11 a.m. for additional cost paid upon service to the Press Box) and proceeds will go be donated to the event as well.